The looting and burning of the great Alexandrian Library in Alexandria Egypt by Roman Catholic mobs in 415 AD was a great literary loss for all of humanity. 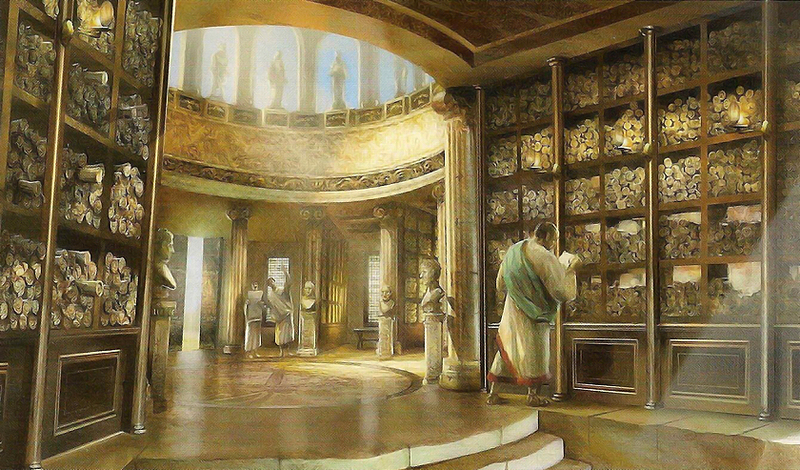 This repository of ancient wisdom and knowledge was founded by Alexander the Great around 300 BC. Collectors were sent to all parts of the world to gather and copy volumes which numbered some some half a million at its peak. Among the great scholars who worked there were Aristarchus -who developed a sun-centered model of our solar system, Erasthosthenes -who accurately mapped the Earth, Hipparchus -who determined the precession cycle of the equinoxes, Claudius Ptolemy -the father of modern astrology, and Hypatia -the beautiful and intelligent spokesperson for the library who was butchered by Cyril and his fanatical "Christians". Apparently, the great knowledge contained in the rolls was a threat to both the political and religious invaders of the time, so it was done away with. Nothing is ever permanently lost, however; this knowledge can still be accessed on the astral plane. The demise of this great library brought on the Dark Ages.